Interview with Kavich Neang: "Every night after the shooting, I would have dreams about this building, all my dreams were about my neighbors and the people in the building..."
Born in 1987 in Phnom Penh Neang’s family was one of many living in the historic White Building. He studied dance and music before he graduated in professional design at Limkokwing University of Creative Design. In 2010 he made his first short film and has collected experiences as director, editor and cinematographer for various projects besides his own. His first feature documentary “Last Night I Saw You Smiling” screened at this year’s International Film Festival in Rotterdam and won the NETPAC Award for best Asian film. 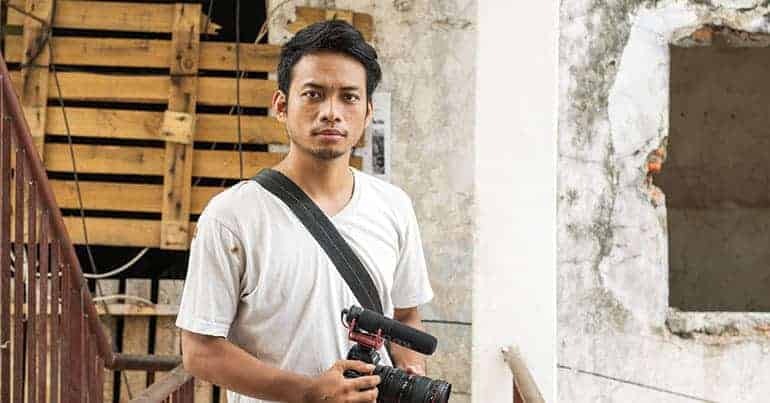 With Asian Movie Pulse, the Cambodian director talks about his experience filming his first feature, the film industry of his home country and the importance of the White Building. Can you explain the title of your film, “Last Night I Saw You Smiling”? The title of this film is inspired by the Khmer songs from 1960s-1970s era in Cambodia, the same period when the White Building was built. In the last weeks of the White Building still standing people were packing their clothes and leaving. Every night after the shooting, I would have dreams about this building, all my dreams were about my neighbors and the people in the building living and having a fun time. Cambodia’s capital and its residents who are about to lose their homes. Could you explain the significance of the White Building for your country? Nowadays, there are not many buildings from that period left, some have been demolished and replaced with new condominiums and malls. The White Building was one of the most historical and unique buildings in Phnom Penh, built in 1963 by Cambodian architect Lu Ban Hap and Russian architect Vladimir Bodiansky. For me, it is not only just an old white building. With its long history and design, it’s quite important for my country, especially right now since Cambodia has changed so fast over the last decades. Besides your personal connection to the building, why and when did you decide to make it and its residents the center of your feature debut? The footage in the film was created by coincidentally. I focused on every moment I had with the building rather than thinking of the story. From that, I shot every single detail, every image of what I saw. Before I made this project, there was only my memory of the place and the people which I had. Did you receive any support for your project? As far as I know there are some organizations dedicated to the memory of the White Building. Here are the institutions which have supported me so far, and please check the link for more information. How did you convince the residents to help you and ultimately give you quite an intimate insight to their homes, their families and their plans for the future? I just told them them that I’m documenting the White Building before it would be demolished. I think because everyone knows me well that is why I could film them naturally. As you can see it during the film, everyone was happy to share their last moment with me in front of the camera. Would you consider your film a warning or more like a memory? This film is about my memory of the place, the White Building where I grew up and spent most of my life. What is your opinion of the Cambodian film industry at the moment? Compared to Vietnam and Thailand it is a very small industry. Since there are no film schools we cannot make films without support from the outside. When I want to make short films, I use crowdfunding to find support. What are your plans for the future? Do you have any projects you are working on now? Yes, I am shooting a feature fiction film titled “White Building” later this year. It’s a coming-of-age story of Samnang who faces the loss of his lifelong home.